You should probably check out 101 Vape’s updated clearance section – they have a bunch of outstanding deals right now! This particular one caught our attention since the selection of attractive tube-shaped mods on the market is limited. The Wismec Sinuous SW Mod is nothing like we’ve ever seen before with it’s futuristic, light-saber inspired design. It houses a large 3000mAh battery and operates with a single button for up to 50W of output. 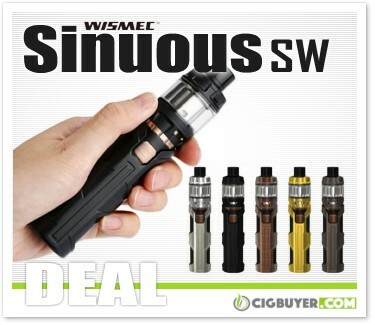 The Wismec Sinuous SW Kit comes in several attractive colors and is sold with – or without – a matching 2ml / 4ml Elabo SW Sub-Ohm Tank. It’s top-filled with bottom adjustable airflow and includes with two 0.2 ohm triple coil heads. * Expiration of this special clearance deal is unknown. Good while supplies last.